HO CHI MINH CITY, Vietnam, March 18, 2018 /PRNewswire/ -- To be launched from 12 to 14 September 2018, Vietnam's International Renewable Energy and Energy Efficiency Exhibition (RE & EE Vietnam) returns to Saigon Exhibition and Convention Center, Ho Chi Minh City, Vietnam. Amongst the emerging markets in the region, Vietnam offers many opportunities for investment in renewable energy, in particular, wind and solar. With a population of 92 million, Vietnam's GDP growth reached 6.81% and the nation's index of industrial production (IIP) increased by 9.4% in 2017 as reported by the General Statistics Office of Vietnam. The country's energy demand is forecasted to grow 13% annually over the next four years with an energy policy to increase RE in the energy mix. The revised Power Development Master Plan VII has revealed that Vietnam needs power investments amounting to USD 150 billion for the period up to 2030 to keep up with the nation's 10-12% annual demand growth. The renewable energy sector is a priority to investment with contributions set at 7% by 2020 and 10% by 2030. "The biggest opportunity for foreign countries in Vietnam is that Vietnam has an increase in energy demand, and it has a policy that is considered to greatly support the market." said Prof. Dr-ing, Christoph Menke, Professor, Trier University of Applied Sciences "I see huge opportunities not only in renewable energy products, but also in other manufacturing products for renewable projects as well". 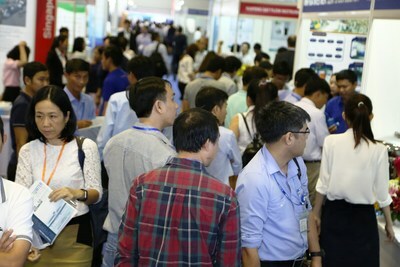 As last year's RE & EE Vietnam 2017 onsite survey, 85% of the exhibitors were able to generate sales leads during the show and 76% were satisfied with the business opportunities. Mr. Henry Chen, Managing Director, Xiamen Mibet New Energy co. ltd, one of RE & EE Vietnam 2018's participants, shared that with their mission to "let every family enjoy their own energy", Mibet will again take part in RE & EE Vietnam to improve their international sales marketing network and quality management system, as well as upgrade competitiveness to lead the development of renewable industry.